Morning Pointe Senior Living co-founders Greg A. Vital and Franklin Farrow announced the promotion of Aaron Webb to the role of chief operating officer. After a year and a half as the company’s executive vice president, Mr. Webb will now oversee Morning Pointe’s daily operations. As part of Mr. Webb’s promotion to chief operating officer, Mr. Farrow will now serve as chief executive officer, and Mr. Vital will serve as president and chairman of Morning Pointe’s board of directors. Morning Pointe Senior Living, a Chattanooga-based senior healthcare services company, is the developer, owner, and manager of 32 Morning Pointe Assisted Living and The Lantern at Morning Pointe Alzheimer’s Memory Care Center of Excellence communities in five southeastern states. A Chattanooga native, Mr. Webb holds a Juris Doctor from the University of Tennessee College of Law in Knoxville and an undergraduate degree from Denison University in Granville, Ohio. 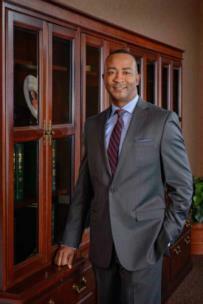 He serves on the board of directors for CHI Memorial, the Tennessee Aquarium, and the Chattanooga Chamber of Commerce. Mr. Webb brings more than 20 years of strategic business, financial, and legal experience to his new role. He previously held executive positions with Life Care Centers of America, the Electric Power Board, and Fidelity Investments. A veteran in corporate business strategy, Mr. Webb takes pride in helping create an environment that honors seniors and allows them to thrive and maintain active, healthy lifestyles. “I have found my niche with Morning Pointe because it is the perfect blend of healthcare and hospitality while providing me with an opportunity to serve our seniors,” he said. Mr. Webb resides in Chattanooga with Marie, his wife of 23 years. Together, they have three daughters. He is a member of Orchard Knob Baptist Church and enjoys running, playing piano, reading, and following sports.